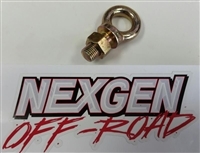 EYEBOLTS WORK FOR MANY APPLICATIONS 7/16 THREAD, 5/8 EYELET HOLE SHANK LENGTH IS 7/8"
Double Shear Seat Belt brackets. These also work great as Limit Strap brackets. From Center of hole to mounting is 1.25". They are 1/8" thick with a 1/2" hole so they will work fine with all seatbelts. They are also made with 2 faces so the belts or limit straps are doubly secure. 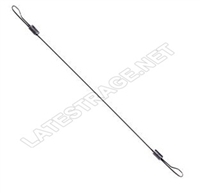 Seat Harness Cutter is light weight and safe to carry in any vehicle. The cutter is made from durable plastic with a stainless steel blade. The cutter has a built in grip so your hand wont slip while cutting. A must have for competitors that may need to get out in a hurry! Includes sliders for one seat. 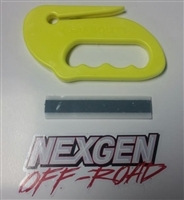 Contact Nexgen Offroad for available colors and options. Sold each for one seat.